Unit trusts investment is an option that allow investors to invest into money market securities, stocks, bonds, and derivatives through professional investment managers. An investor can start his unit trust investment journey by investing as little as $1000 to get an opportunity to establish a broadly diversified portfolio of assets with a relatively small fee. Unit trust investment is also known as managed investment funds, an investor pools his money with that of thousands of other investors so that the fund can buy a wide range of investment options managed by a professional team. The unit trust investment fund can be large enough to allow fund managers able to control and reduce risk through greater diversification. Some unit trust funds even invest into large commercial properties and corporate bonds which may not commonly be available to individual investors. Unit trust investment are a simple and convenient option for people who have a long-term investment horizon but do not have either the time, desire, or expertise to invest directly in financial markets. If you are fallen into this category type of people and you would like to invest, unit trust investment is then a really good start out. Simply because the investment fund managers have their consistent portfolio investment philosophy. This would allow them to stand a better chance to outperform individual investors because of their professionalism. They are employed full-time professionals that monitor the investment market, actively manage the respective fund portfolios using rigorous research to achieve optimum fund performance, and have greater access to obtain the most up-to-date, reliable, quality market news and information. They also have proper risk management process and controls to ensure that risks in the portfolio are assumed with a full understanding of its impact on the investment portfolio and by so doing improve returns without limiting opportunities. Therefore, invest in unit trust portfolio using professional fund managers can generally provide better returns over the long-term. Generally, unit trust investment funds can be categorized under equity funds and bond funds. Equity funds invest in stocks. It is suitable for investors who have bigger risk appetite and want their money to grow over the long period of investment horizon. Bond funds invest in bonds, and it is catered for investors with small risk appetite who seek for steady stream of fixed income and do not fluctuate as much in value as equity unit trust funds. Balanced funds, or called asset allocation funds, is a unit trust investment funds that has the mixed combination of both equity funds and bonds funds. Thus, balanced funds offering the best of both funds, giving potential growth from equities and income from bonds. If you are just a newbie investor with little start out investment money, unit trust investment is a good start out because of its instant diversification and professional expertise at a low initial price. When your investment knowledge, skills, and confidence are better improved and you are ready to expose more, investing personally in stocks and bonds will be an appropriate next step. The Dow surged as high as 115 points to 11248 amid better than expected September’s existing home sales and the National Association for Business Economics (NABE) said that 3Q employment conditions jumped to the highest level since the start of the 2008-2009 recession. The survey also showed expectations for hiring over the next 6 months rose to the highest level since 2006. Nevertheless, sharp falls on banking stocks amid the foreclose concerns sparked profit taking activities and capped gains at 31 pts to ended the day at 11164. Meanwhile, the dollar, which sunk to a new 15-year low against the yen earlier, was trading lower against a basket of currencies. The dollar index was last down by 0.4%. 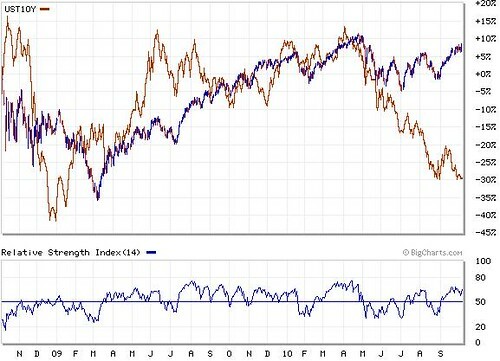 The weakness in the dollar has helped push commodities and bond prices higher. After the bell, despite topping Wall Street’s estimates, Texas Instruments price slipped as the company offer a weaker guidance on its 4Q10 revenue. On the back of more economic data and corporate results onslaught this week, together with the midterm elections and this week's triple-whammy, the Dow could witness more swings ahead. Immediate resistance levels are situated around 11300-11500 while immediate support levels are 10600-10800. 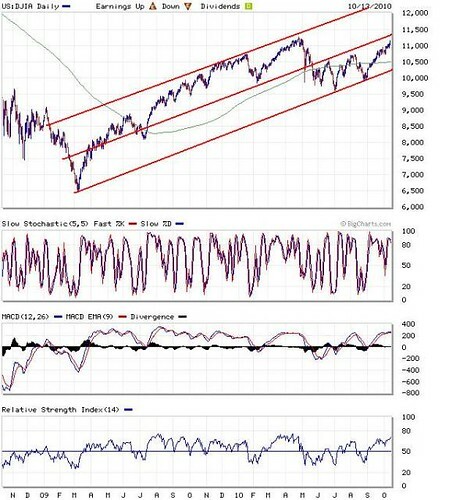 Daily Dow Jones is testing the upper channel. Dow Jones closed 14 points lower to 11,133 level as worry about the weekend meeting of global finance officials kept pressure on the index. The market is watching whether officials, in preparation for a G-20 summit in Seoul next month, can agree on managing exchange rates to cool what's been called a "currency war." So far, nearly three-quarters of the S&P 500 companies that have reported 3Q2010 results have topped analysts' estimates, but traders remain concerned about currencies and the mixed economic backdrop. Wow, the Dow rose 0.6% for a 3rd straight week of gains as encouraging earnings helped the market sustain upward momentum, coupled with expectations of Quatitative Easing 2(QE2) by Fed. Over the weekend, the G-20 ministers (a precursor to a larger G-20 summit meeting in Seoul on 11-12 Nov), agreed that they would "move towards more market determined exchange rate systems that reflect underlying economic fundamentals and refrain from competitive devaluation of currencies." Although tensions of trade war will be reduced in the short term, the immediate direction of markets will likely be driven by next week’s FOMC meeting as Bernanake signals it may buy more assets. For Wall Street, it could see wild swings in the market this week as investors will face a blizzard of earnings and economic reports (please refer to major US economy and corporate earnings table), approaching midterm elections and this week's triple-whammy. 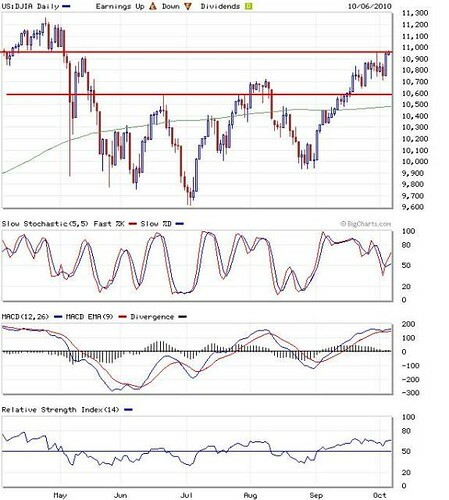 Dow’s immediate resistance levels are situated around 11300-11500 while immediate support levels are 10600-10800. Daily DJIA shows immediate resistance situated at around 11,300 to 11,500 levels. Dow Jones rose as much as 106 points to 11214 (52-wk high:11258) on commendable China’s 3Q2010 GDP numbers and better-than-expected earnings from McDonald, UPS, Caterpillar, Nokia and Travelers. However, the momentum fizzled out amid weakness in banks and strengthening US dollar that pushed the index off high to close only +38 points. Bank of America Corp, facing demands for refunds from mortgage-bond holders, tumbled 3.3 percent to a 16-month low whilst a government report said Fannie Mae and Freddie Mac, the mortgage-finance companies under U.S. conservatorship, may need as much as US$363 billion in aid through 2013. There is also speculation that the QE2 will be smaller-than-expected as the U.S. Treasury Secretary Timothy Geithner said on Thursday that the Fed's action won't be as large as expected, sending the dollar higher and taking steam out of the stock market's early rally. After the bell, American Express and Amazon reported earnings that topped estimates. The general upbeat mood on the ongoing reporting season is likely to provide a good catalyst to surpass 52-week high of 11258 points. However, we expect more volatility ahead of the Nov 3 FOMC meeting as there is renewed concern that QE2 will fall short of market expectation and lingering concern about banks’ mortgage crisis remain. Dow Jones’s immediate resistance are situated around 11200-11300 levels while immediate support are 10600-10800 around levels. Daily Dow Jones is trying to retest 52-week high of 11258 level. There are many types of investment bonds in the market. Each type of investment bond has its own feature, which make them unique. It is very important to know the type of investment bond featured benefits. If an investment bond feature benefits the investor, then the investment has lower risk, so as the yield, and its price should be higher. In the other way round, If an investment bond feature benefits the issuer, then the investment has higher risk and yield, and its price should be lower. Therefore, as an investor, once we know who benefits from the feature, then we stand a better investment position whether to pay more or less for the type of investment bond before investing. Below are some of the most common bonds in the market. Government bonds are issued by the monetary authority of a country. At the time of issue, government bonds have maturity period from as short as one year to as long as 20 years. Corporate bonds are issued by corporations, mainly bought and sold by private and public institutions. They offer limited interest from retail investors. Secured bonds are backed by some specified assets such as mortgages or account receivables for investors to be convinced to park with their money. For example, a mortgage backed secured bond bundles mortgage, and then sells investors the right to receive the payments that consumers make on those mortgage loans. Unsecured bonds or sometimes called debentures are the most commonly issued type of investment bond. Although it may sound risky, they are generally not. They are backed by the issuer's credit quality. In general, the higher the issuer's credit quality, the higher the chance the borrower will make the payment to investors as promised. Therefore, the investor's risk is reduced. Debentures are issued by high credit quality corporations and institutions, and they are often more highly rated than secured, asset backed investment bonds. Convertible bonds are hybrid investment which contains a bond and a stock. If an interest rate risen, the bond will fall in value. However, investor can still benefit from the risen stock price by converting it to common stock. If an investor choose not to exercise the convertible, the investor can benefit from the bond's interest income until the its maturity. This type of investment bond is suitable for investors with low risk profile, and seek for regular income with downside protection against falling share prices. Convertible bonds rate of return is lower than non-convertible bonds. High yield bonds as the name suggested, pay higher interest rates to investors. This types of investment bonds' grade is lower, and are issued by emerging market economies such as those good companies which fallen on bad economy times. Therefore, they are riskier than investment graded bonds. Zero-coupon bonds pay no coupon interest during the tenure of the bond. But, the coupon interest is accumulated and paid in one lump sum at the time of maturity. This types of investment bonds are normally sold at a discount. Floating-rate bonds or name floaters, is a type of investment bond which periodically adjust the coupon interest rates base on the current market interest rates. If the market interest rates risen, the coupon interest rate will be adjusted to higher. If the market interest rates fallen, the coupon interest rate will be adjusted to lower. Callable bonds is riskier and offer a higher rate of return. The issuers have the right to call back the bond anytime and repay its debt before maturity. This occasion normally happens when interest rates fall, the issuers will call back the bond and reissue another bond at a lower rate of interest. Despite earnings results that topped Wall street’s estimates, Goldman Sachs and Bank of America shares tumbled and dragged the overall market as the Dow plunged 165 points or 1.5% (intraday losses: 226 points) to a two-month low of 10979. After surging 14% since end June 10, the overnight 1.5% fall on Dow was overdue. 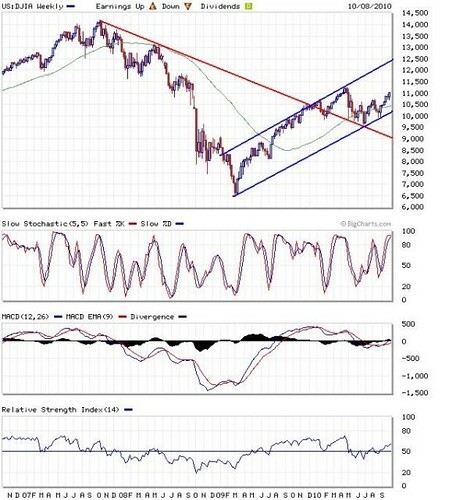 With the breach of the up-trend-line UTL support and weakening technical readings, the Dow Jones’s immediate outlook has turned bearish. Immediate resistance level is 52-week high of 11308 while immediate support levels are 10801 (30-days SMA), 10642 (40-days SMA) and 10507 (200-days SMA). Daily Dow Jones shows downside bias amid a breach in up-trend-line and deteriorating technical. Daily Dow Jones indication shows that it has more downside bias as technical readings turn weaker. Immediate resistance level is 52-week high of 11308 while immediate support levels are 10990 (10-d SMA), 10890 (20-d SMA) and 10756 (30-d SMA). On the back of a strong Google results (released after Thursday closing) and a bevy of positive economic reports on consumer spending; tame inflation data and Empire state manufacturing index, the Dow rose as much as 46.7 points last Friday after Bernanke said the central bank has "a case for further action" to stimulate the economy, citing high unemployment and low inflation. Nevertheless, the index ended 32 points lower to 11063 amid a dip in consumer sentiment index and bank shares slumped as concerns on the potential foreclosures crisis could erupt into costly litigation, fines and additional mortgage repurchases on banks. Sentiment was also dampened by General Electric, as the conglomerate's revenue came in short of Wall Street's expectations. 18/10/2010: September Industrial Production, IBM, Apple, & CITI Group. 19/10/2010: Bank of America, Goldman Saach, Johnson & Johnson, October Housing Starts. 20/10/2010: October Beige report, Morgan Stanley, & Seagate. 21/10/2010: Caterpillar, McDonald, & UPS. 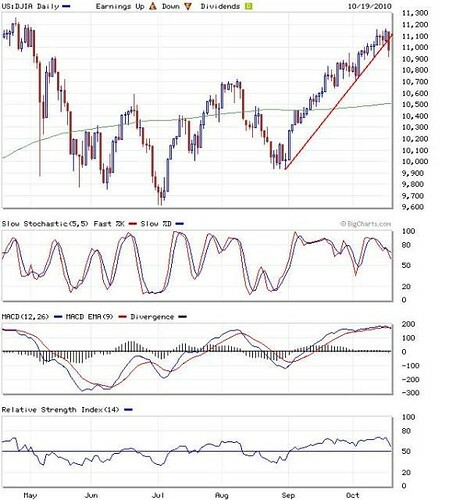 Daily Dow Jones shows critical support around 11,000 as technical indicators lost in strength. Wall Street ended flat in a volatile session as investors fretted a surprise expansion in weekly jobless claims, a widening foreclosure crisis and expanding Aug trade deficits that could undermine the market's strength over the last five weeks. Nevertheless, the technology sector continued to show strength, as Google and AMD share price soared following their better-than-expected 3Q2010 results. During the regular session, banking shares such as JP Morgan, Bank of America and Wells Fargo slid amid concern over growing legal scrutiny of home foreclosure practices. Despite an overbought market, as long as major Dow Jones component stocks are able to report earnings that beat Wall street’s estimates, the Dow is likely to consolidate upwards ahead of the FOMC meeting on Nov 3. Immediate resistance level is 52-week high of 11308 while immediate support levels are the psychological. Wall Street rose for the 4th consecutive sessions as the Dow Jones jumped as much as 135 pts intraday amid strong JP Morgan’s results and speculation that Fed is moving toward a more accommodative policy during the FOMC meeting on November 3. Nevertheless, profit taking activities capped its gains and the Dow Jones closed off high with a hike of 76 points to 11096. In anticipation of more Quantitative Easing (QEs) by Fed, the lingering weakness in dollar pushed the 10-year Treasury yield higher at 2.43% while commodities such as gold surged 1.8% to a record high of US$1370/ounce and oil spiked 1.3% to US$83/barrel. The ongoing positive Dow component results by Alcoa, Intel and JP Morgan coupled with anticipation of more stimulus measures by Fed are expected to continue lift investors’ sentiment again. Morgan), we could see more momentum play to push Dow higher despite an overbought market, and ahead of the FOMC meeting on November 3. 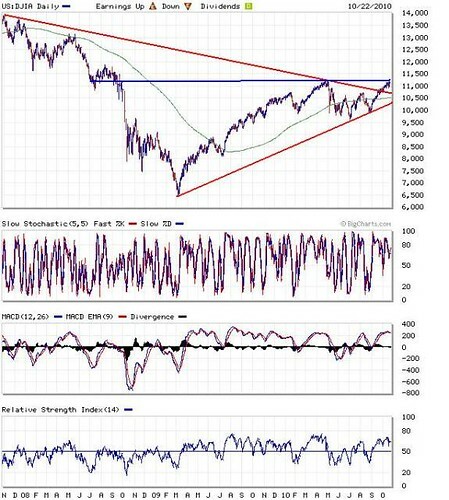 Immediate resistance level is 52-week high of 11308 while immediate support level is 200-d SMA of 10500. Daily Dow Jones indication shows that it is heading towards the middle upper trend line (UTL) channel. Dow Jones lost as much as 97 points in an intraday before recovering 10 points at 11020 after Fed’s September meeting minutes suggested that it will make good on its previous pledge and act soon to provide additional support for the economy as pace of the economic recovery is slowing. After the bell, Intel reported 3Q2010’s profit and sales figures that rose sharply from a year ago and beat Wall Street's forecasts. It also offers a cautiously optimistic outlook for 4Q. After Alco’s results announcement on 7 October, Intel is the 2nd Dow Jones component stock that topped the 3Q2010 estimates. Two Dow Jones’s components will report their results tonight (JPMorgan) and Friday (GE) whilst technology bellwethers Google and AMD will release on Thursday. Ahead of the FOMC meeting on November 3 and the release of more corporate results, Dow could be heading towards more consolidation following its recent strong gains. 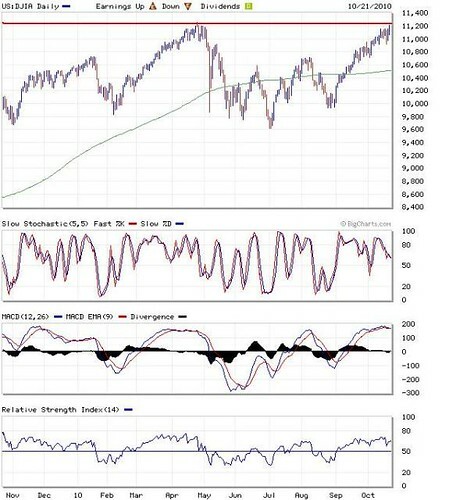 Immediate resistance level is 52-week high of 11308 while immediate support level is 200-d SMA of 10500. The Dow Jones ended 58 points higher to 11006, closing above the 11k key level for the first time in the the passed five months and recorded its fifth weekly gain of 1.6% over the last six weeks. Wall Street this week may pay more heed to corporate results as heavy weights like Intel (Tue), J.P. Morgan (Wed), Google (Thu) and GE (Fri) are scheduled to announce their 3Q results. Besides, expectations of more quantitative easing could keep the U.S. dollar on a downtrend, which in turn signals more gains for Dow Jones. An inverse correlation between the greenback and U.S. stocks has prevailed in the last 12 months. Fed. Immediate support levels are 10500-10600. 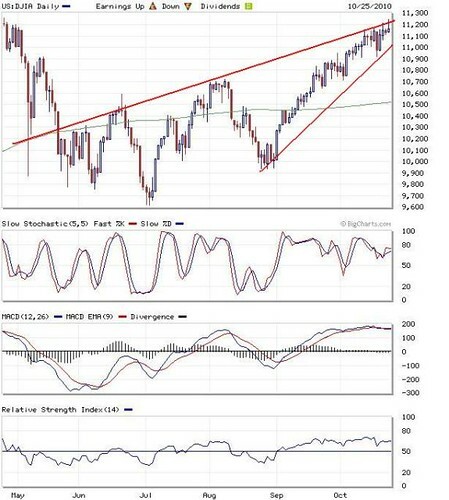 The 5-Year weekly Dow Jones chart shows it is consolidating above the UTL (upper trend line). Dow surges 194 points to a 5-month high record. The Dow Jones surged as much as 214 points intraday before closing 194 points higher at 10945, following strong September ISM non-manufacturing index of 53.2 (consensus: 52.3; August: 51.5), a hopeful sign for the largest area of the economy and the main source of employment. Meanwhile, sentiment was also boosted by a surprise move by Japan's central bank to lower its key interest rate to between 0% and 0.1% and its pledge of a more quantitative easing (QE) measure to purchase about US$60bn of government bonds and other assets to stimulate its economy. Please refer to separate report today for our comments on this news. The dollar fell to a six-month low against the euro at 1.384 and lost ground against the Japanese yen at 83.2. Investors shed defensive assets and commodities rallied with crude-oil futures closing at a five-month high, rising 1.4% to US$83/barrel, while gold futures ended at yet another record high of US$1,340/ounce. Daily Dow Jones shows that the near term outlook is boosted by the better than-expected non ISM manufacturing numbers coupled with more quantitative easing (QEs) by FED to stimulate the economy. Should the highly focused September non-farm payrolls report (October 8), as well as the forthcoming 3Q10 earnings season do not fail market expectations, we may see a resumption of further rally to retest its 52-week high of 11309. Supports are situated at 10500-10600 points. 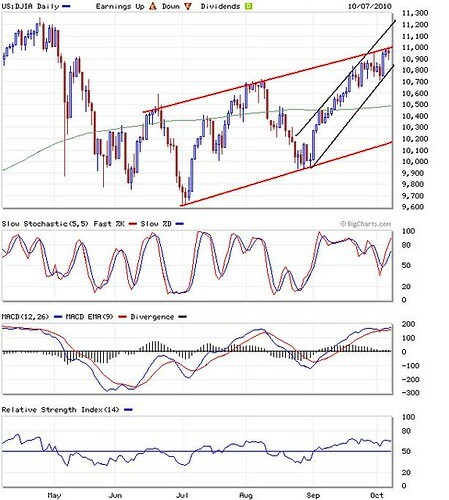 Daily Dow Jones Shows possible resumption of uptrend to retest 52 week high of 11309 amid overnight surge. Daily Dow Jones Versus US 10 Years Treasury Yield chart shows that more upside bias amid another round of quantitative easing (QEs) Measures. Dow Jones loses 78 points ahead of 3Q results season at 14751, following ratings downgrade on Microsoft, Alcoa, JC Penny and Macy ahead of the corporate earnings season and key employment data due later in the week. Sentiment was also dampened by the disappointing economic data of a 0.5% drop in August factory orders (consensus: -0.4%) and worries about euro zone debt, keeping investors away from riskier assets and sparked profit-taking after the recent rally. Troubling economic news from Ireland, Portugal and Greece renewed concerns about the euro zone debts, hurting the euro currency and sending the safe-haven U.S. dollar higher. For Wall Street, the strength of September’s momentum will be tested this week by several economic data, including the much attention paid non-farm payrolls report, as well as the start of 3Q earnings season. 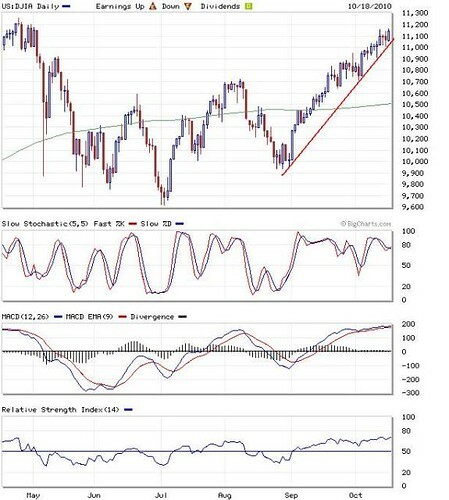 We expect more volatility on Dow Jones, consolidating within a wide range bound 10500-11000 levels in the short term. Daily Dow Jones indicates the impending dead cross in MACD, signaling more downside consolidation. Daily Dow Jones shows that it is undergoing consolidation ahead of the 3Q reporting season. The Dow was up as much as 79 points amid strong September PMI of 53.8 (August: 51.7) in China and a better-than-expected US personal income and spending in August coupled with expectations of more quantitative easing after Fed officials said more must be done to lift the weak economy. The US$ slipped to a 6 month low against Euro at 1.38, crude oil rose 2% to US$/82/barrel whilst gold surged to another record high for the 6 straight days at US$1316/ounce. However, slower monthly growth in September ISM of 54.4 (Aug:56.3) and consumer sentiment index of 68.2 (Aug: 68.9) spurred profit taking activities ahead of some key economic data and earnings release this week, namely August factory orders (4 October), September ISM non-manufacturing index (5 October), September ADP report (6 October), 3Q 2010 Alcoa results (October 7) and September job data (October 8). For Dow Jones, the strength of September’s momentum will be tested this week by several economic data as well as the start of third quarter earnings season. 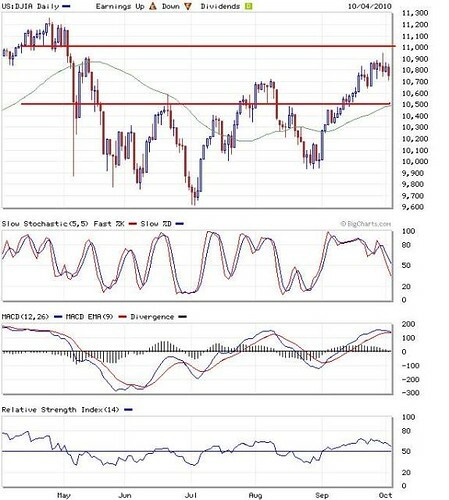 We expect Dow Jones to consolidate within a range bound 10500-11000 levels in the short term.